Third Graders have started their Star Spangled Banner unit. For the next couple of weeks they will be working in cooperative groups and cycling through various workstations. By the end of this unit, students will be able to sing the national anthem from memory, recall key elements of the history of our national anthem and be able to define vocabulary from the lyrics like "perilous" and "ramparts". The listening station has several examples of our national anthem. These boys are listening to Jimi Hendrix's version. The story of the writing of the "Star Spangled Banner"
Write on! Racing to write the lyrics! Who was Francis Scott Key? So, what IS a rampart? Star Spangled Treble Clef workstation. Whew! This is a hard one! This week 5th and 6th graders brainstormed nature words that had one and two syllables and matched them up with quarter notes, half notes and eighth notes. Then they used these notes to compose rhythms and play them on classroom instruments. Arranging their compositions into rondo form, students performed for each other. This week Kindergarteners were introduced to the claves, bongos, tambourines, maracas and triangles in music class. After discussing how to play each instrument student demonstrated steady beat. First Graders played "Rockin' Stix" using their reading skills and Mrs. King's favorite instrument-rhythm sticks! Then they composed patterns for rhythm sticks using a composing grid and poker chips. The chips represented a quarter note or "ta" and the empty spaces represented a quarter rest. What four syllabled words can you think of? Coca-Cola, macaroni, watermelon and huckleberry are just a few that fourth graders came up with. They used these words and other food themed words to create some amazing rhythm patterns. Then to show their understanding they did a bit of rhythmic dictation. I played a rhythm on a wood block. Students wrote down the rhythms that they heard using musical notation. We focused on quarter notes, barred eighth notes and 4 16th notes. Wow! They were able to write down the most complicated rhythms I could think of! In the pictures below they are working with their lap packs and dry erase markers to write down the rhythms they just heard. Wooo Hooo! Did you know that Wal-Mart carries tie dye duct tape??? I love this stuff! This week I used it for our "Swat the Staff" game. Seventh and Eighth Graders played this game to review treble clef pitches. Choosing from a wide array of flyswatters, students paired up to speedily swat the correct note. Kindergartners are becoming experts at body percussion. After learning several songs with snapping, clapping, patting and stomping students were able to perform "Charlie Over the Ocean" in four parts! Way to go!!! Next students read a music chart with symbols for body percussion. The pictures below show students creating their own body percussion pieces and performing them in groups. Teachers who are interested can go HERE. Click downloads and then scroll down to "Body Percussion". Second Graders are GREAT rhythm readers! They can read, write and perform rhythms using quarter notes, eighth notes and quarter rests. This week we used School Bus Rhythms to practice identifying rhythms. Second Graders were able to do two rhythms at once! Awesome! I know! I know! Kindergarteners already know the ABC song. You're right! So we take it to the next level. We use alphabet charts and poker chips to create variations of the ABC song. We choose a few letters to cover and then sing the song. The trick? We only hum when we get to a letter that is covered by a chip. This is much harder than it seems, but this Kindergarten class performed like pros! Way to go! You probably know the American folk song, "Chicken on a Fencepost". My students LOVE this simple song and the accompanying game. 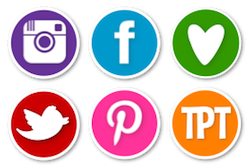 In this post we'll talk about some great activities to use with this song. I teach this song by rote and often use it to introduce 16th notes. During our first class period with this song we just learn it by rote and I tell them that the next time they come we'll use our detective skills to figure out the rhythm of the song and perform a play party game if we have time. The next class period, we review the song. We pat the steady beat while singing and practice clapping "the way the words go" or the rhythm. Next, we use a visual aid to help us notate the rhythm. In the picture below, you see a Smartboard file in use. I don't have this file available for download, but it would be easy enough to replicate. 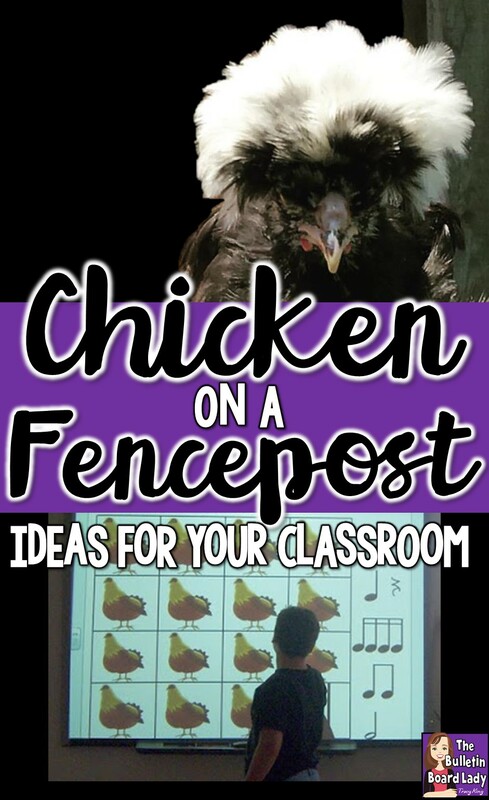 Create a 4x4 table and put a chicken in each square. 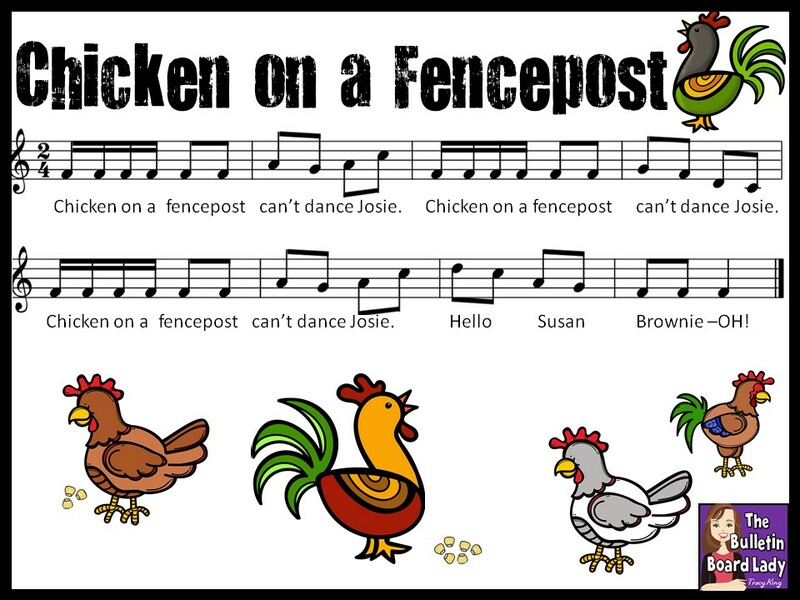 As students figured out the rhythm, they dragged the correct note and dropped it on top of the chicken. In addition to projecting the file and figuring out the rhythm this way, I've also projected a plain page with the 4x4 chicken grid and had students draw over them onto the board with a dry erase marker. We've also done it on paper when technology wasn't available. 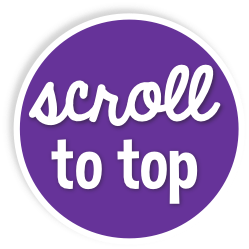 You can download this farther down in this post. As time allows (and I usually make sure we have just a few minutes) we get into concentric circles and practice walking and singing the song. I never actually plan to teach the entire game the first time. I know. I'm such a meanie. What I want to do is build anticipation. Before we leave on day 2 I introduce them to my friend, Captain Cluck. 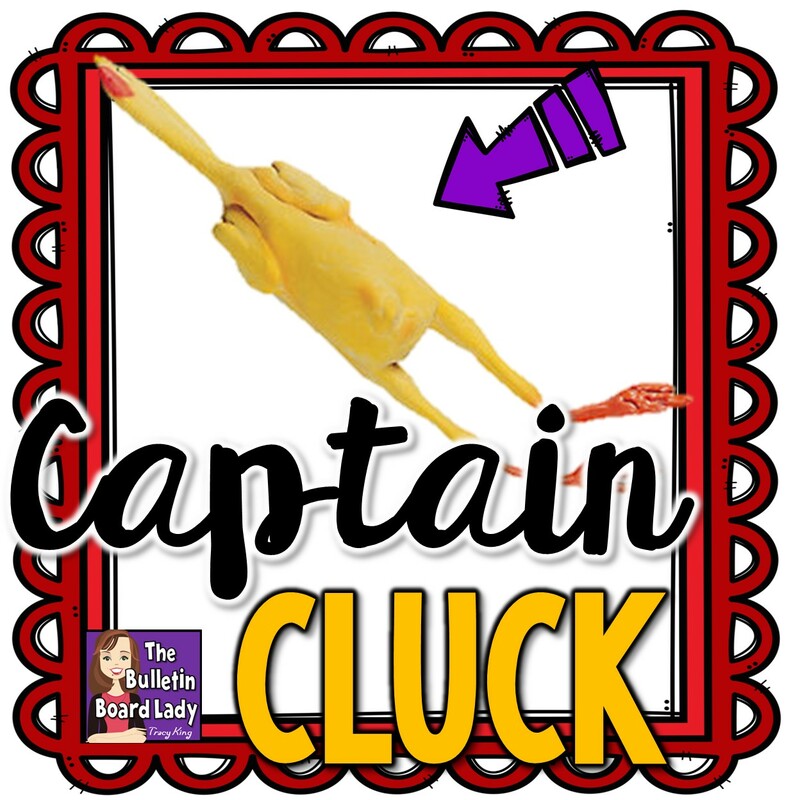 Captain Cluck is a rubber chicken that I bought from Oriental Trading. There's nothing really special about him, except he is the Captain of the "Chicken on a Fencepost" game. Okay...he is totally special and sits at a place of honor on my shelf and sometimes on really bad days I'll talk to him like he can hear me, but I try not to share that with the kids. They already think I'm crazy. So, the kids leave singing this fabulous folk song, excited to come back to music to learn the rest of the play party game and play with Captain Cluck. Music teacher win! I think there are probably several variations of this game out there, but this version is my favorite. The starting formation is to have students in two concentric circles. I tend to make the center circle much smaller than the outer circle. In the middle of the center circle is where Captain Cluck resides. In addition to the two concentric circles, I pick two foxes to stand on the outside. Basically they are "it" and try to get through the gates that will pop-up during the song and grab Captain Cluck. I have students join hands (Always say "join hands" not "hold hands" when talking to your students. Trust me on this one.). I have the foxes cover their eyes or step outside the room if the setting allows while I walk through the circle and touch a place for the gate to open on each circle. The foxes come back and we begin singing and walking in our circles. When we sing the last "OH!" the students' hands that I touched raise them high to create an open gate in each of the circles. The foxes race to get through each gate and grab the chicken. I usually let each fox them pick someone to take their place and we play repeatedly until they are delirious or their classroom teacher comes to pick them up. Here is a great video of a group of educators playing this game. 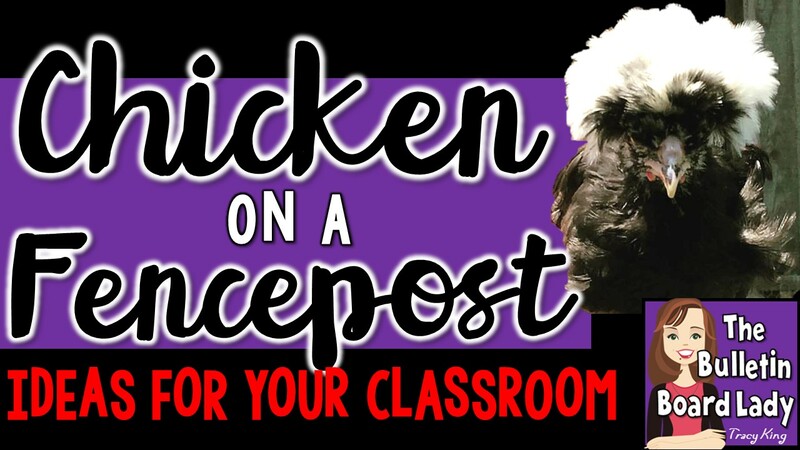 It is great fun and I know your students will love it! I use "Chicken on a Fencepost" with 4th, 5th and 6th graders. You can download the worksheets that I use with my students for deciphering the rhythm of "Chicken on a Fencepost" HERE.